The 60 metre CRN superyacht Ramble on Rose is set to relaunch after undergoing an extensive winter refit at Dutch yard Icon Yachts. It comes after the yacht arrived at the Harlingen-based facility in the Netherlands in September last year. Due for completion in April, the refit work has finished on schedule. The main refit on the yacht included a completely new exterior paint job, the replacing of all windows and various interior improvements. A completely new bridge was also installed. Delivered in 2011, the 60 metre, three deck Ramble on Rose was designed by Zuccon International Project, while interior design was handled by Laura Sessa Design. 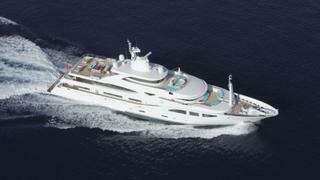 She can accommodate a total of 12 guests while her crew quarters can house a total staff of 14. Power from two 1950.0hp Caterpillar 3512-B-DITA diesel engines generates a top speed of 15 knots and maximum cruising range of 3500 nautical miles at 12 knots.